Welcome to the Library of the Future! News: The McLuhan Library will be shown at the Learntec'2007 in Karlsruhe! The McLuhan Documentation Center is one of the most advanced scientific libraries for new media worldwide. Located in the MediaDocks, the former granary of Lübeck, the McLuhan library is operated by the ISNM - International School of New Media gGmbH, an affiliated institute at the University of Lübeck. The McLuhan Library constitutes a core piece of education at the ISNM. Students have 24 hours seven-days-a-week access and are entering a research place, which is in the process of becoming one of the most advanced libraries in Europe. 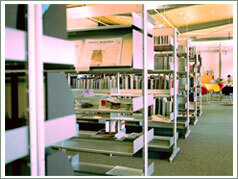 The McLuhan Center Library offers a unique collection of books and electronic media in the area of culture, business, design and technology, which is constantly being expanded upon. Our objective is to enable our students and visitors to work and research in one of Europe's most sophisticated academic collections. Today's university library is becoming a hybrid or gateway library that is reaching both ends of the continuum, namely the conventional and digital library. The hybrid library should support electronic and printed information sources seamlessly in an integrated learning space. Due to their skilled staff and still incomparably rich content, libraries can offer highly qualified services and social contexts, which still cannot be reconstructed in the Cyberspace in a convincing manner. We want to encourage librarians and technologists to foster interdisciplinary research orientated towards the creation of advanced library services. We believe that the future library should comprise at the same time a physical space and virtual interface. Libraries should still be in buildings and maintain information collection on physical data carrier (printed or electronic). But libraries should also be high-tech centers with advanced possibilities for browsing virtual and digital information worldwide. The library of the future should be a ThinkTank and exploration center for information querying, using newest available technology in a most suitable form, thus placing the customer into the center of the modern knowledge society. The McLuhan Library is, however, moving beyond the gateway library by starting to use its ubiquitous computing infrastructure. A central research area of the ISNM is the integration of latest media technologies into hybrid libraries to realize innovative learning concepts combining conventional and digital media items. Artificial librarians (Avatars) using 3D graphics, and many more. Please explore the possibilities and take a look on the research section. The McLuhan Documentation Center is sponsored by the Innovationsstiftung Schleswig-Holstein and the Ministry of Science, Economics, and Transportation in Schleswig-Holstein (HWP-Hochschul Wissenschafts Programm). Please take a virtual visit of our library or download our flyer.